Yes, for the next year or two your bank examiner may make the mistake of crediting you for exercising your disaster plan when you documented an actual crisis but let’s take a step back and think about this before we consider it a “win”. Under best practice continuity management guidelines it is clear that establishing and testing an exercise program is not the same as documenting events that threaten or impact the business. These are two separate best practices. FFIEC examination guidelines state “The board and senior management should establish a testing program appropriate for the size, complexity, and risk profile of the organization and its business lines”. Passively experiencing crisis does not demonstrate a testing program has been established and, no matter what the extent of the crisis, will it be appropriate for the size, complexity and risk profile of the organization. In fact, it may be counter productive and make you look unprepared because you didn’t plan a test. Community banks are likely to have experienced 6-12 crises in a year. What makes this one particularly meaningful? Did you document the other ones? What are your standards for documentation? Test objectives were not set or met (no, “survival” does not count) and only one part of your response plan was tested. The “test” was not comprehensive. Since you weren’t planning to experience this problem, exercise controls were not in place when you had it. You can only manage what you measure. Hypothetically, would you consider going to the emergency room because you thought you might be having a heart attack to be an indicator for your ability to deal with stress? Technically the answer is “Yes”. However, that’s certainly no way to live and if this is your common practice then it indicates you don’t really have a good plan for your health. The same is true for your organization. Why have a heart attack to wait to check and see if your blood pressure is too high? 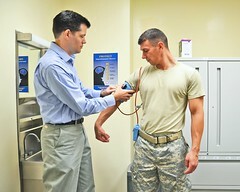 It’s easier to use a blood pressure cuff and check your heart rate. Let’s speak the truth: This is not the attitude of a healthy, mature business and will not, for much longer, meet requirements for safety and soundness. Now, before you get frustrated, I realize you don’t want to do continuity management this way. You have a LOT on your plate that you’d rather be getting to (call reports anyone?) and you’re just not sure where to get started. So, DCS has set up some fantastic tools to make planning exercising EASY for you! Get excited now and bookmark this for future reference! First, go ahead and log that problem you had on our FREE Crisis Event Log. It’s got a couple of brief questions to help you get down the information you need to learn from and properly document the problem. Next, use our FREE Strategic Road Map to get an idea about what a good, well-rounded financial institution can do on to build operational strength. NO, you don’t have to do that big fail-over test right away. We actually recommend against it. Start drilling the little things first. Can you guarantee that you can contact everyone when they’re not at work? Try your call tree out and write down what happens. That’s a great test! Another quick tip is to see what your IT provider is doing to test regularly. We often find out the IT department regularly tests failover procedures but rarely documents it adequately for oversight or examination requirements. All you have to do is start documenting! It’s easy! You can do that! We have also started a new product line: DIY Turnkey Continuity. We’re building very strong key kits for your continuity tool case at affordable prices. We’ve started with a data breach kit and will be releasing an exercise kit before the end of the summer. For our BOL friends, we are looking for pilot users to test these at a discounted rate! Private message me if you’re interested. Also let me know what other kits you’re interested in. Pandemic, social media and vendor management are on our list for 2013. I hope these ideas help out. We realize you are doing everything you can to keep compliant and the business moving in a positive direction. Please let us know what else we can do to make your job easier! It might be an auto repair shop washed away by a flood. A dentist’s office scorched by a fire. A dry cleaner hit by a tornado. A pet store frozen by an ice storm and power outage. There are lots of sorts of businesses, and lots of kinds of disasters, but one thing remains the same: businesses disrupted by disaster permanently close their doors at an alarming rate. In fact, according to the Insurance Institute for Business and Home Safety, one in four small businesses closed by a disaster never re-opens. So, when the unthinkable happens, will you be prepared to lead your business through the crisis? Preparedness is the key! By creating a disaster recovery and business continuity plan, your business can increase its recovery capabilities dramatically. A plan can help you make the right decisions quickly, cut downtime, and minimize financial losses. It can even help you avoid certain disasters through planning and mitigation measures. The prospect of creating and implementing such a plan can be daunting, but business leaders in Tulsa have a unique opportunity to get a head start on the process by attending A Day Without Business, a business continuity summit hosted by Tulsa Partners’ Disaster Resistant Business Council. A Day Without Business will take place on Thursday, March 15, 2012 from 9 a.m. to 3:30 p.m. at the Holiday Inn – City Center in downtown Tulsa. Registration is open through March 2, online at www.tulsapartners.org or by phone at 918-632-0044. The cost for the one-day event is $65, and space is limited. The event’s opening speaker will be Tulsa Chamber of Commerce President and CEO Mike Neal. The luncheon keynote speakers will be Rob O’Brian and Tonya Sprenkle, President and Vice President of the Joplin Area Chamber of Commerce, who will share about their Chamber’s experience with the May 2011 Joplin Tornado. The lead sponsors for A Day Without Business are Tulsa Partners’ Disaster Resistant Business Council, State Farm Insurance, TRC Disaster Solutions and Williams. Other participating organizations for the event include the Insurance Institute for Business and Home Safety, Titan Data Services and the Tulsa Health Department. For more information about A Day Without Business, contact Tulsa Partners at 918-632-0044, tulsapartners@gmail.com, or www.TulsaPartners.org.